Valentine’s Day Pop-Up Shop at Lululemon Birkdale! I am so excited to announce, that I will once again be offering gift arrangements to the public for Valentine’s Day 2019, by way of a pop-up shop, hosted by Lululemon’s Birkdale Village location! This is a special treat both for myself, past and future clients, as I typically only work weddings. But I do enjoy the retail environment and getting to spend the day meeting new faces and most importantly creating beautiful gifts for the recipients. Now, I will note that if you are looking for a standard dozen red roses, then the grocery store is the place to go. I will be staying true to my garden inspired esthetic and yes a little bit of flower snobbery ;-) designing mixed arrangements with luxury specialty florals. These are the kind of arrangements I personally would like to receive. If this timing does not work for you then we may be able to make other arrangements for pick up on a case by case basis. Selections will include Medium sized mixed arrangements of Hydrangea, Garden Roses, Spray Roses, Craspedia and Greenery for $55 in your choice of a whimsical hand-painted ceramic “Celfie” pot or a chic clear glass “Prism” vase. The same mix will be available without a vase for $45 in our signature craft paper and pink tissue wrap. All will be adorned with a gold painted wooden script “love” sign. Colors will be muted soft shades of Pink and Purple with pops of Yellow. Additional designs may be available for purchase at the pop-up shop. Pics below are of my last Lululemon pop-up shop for Mother’s Day. This sale was so much fun and we sold out! I’m looking forward to the next one! Hope to see you there! F E A T U R E D on I Do Y’all! So excited to see our Modern Vintage styled shoot continue to reach a broader audience through publication features! This time you can find all the lovely details over at the I do Y’all wedding blog! Stationary + Calligraphy + Silk Ribbon: Ink Sugar Co.
F E A T U R E D! We love when blogs choose to feature our work! It’s so much fun for a larger audience to get to see these projects that are our passion. This time it’s our Victorian inspired styled shoot collaboration with Radiant Photography by Sydney Danielle getting all the attention. This shoot is slated for 3 more features! But how can you get tired of all this pretty right? See the full feature here on the Chic Vintage Brides blog. Y’all this is soooo exciting! I am collaborating with lululemon at Birkdale Village for a special Mother’s Day Pop-Up Shop, Saturday May 12th from 11am till sell out! I am an ‘events only’ florist, so this is a special treat for all of the women that you want to celebrate this weekend with my garden-inspired creations. I’ll have Wrapped Hand-tied Bouquets (Medium $40, Large $80), Vase Arrangements (Medium $50, Large $90) and Floral Crowns $40. Gaaah she’ll swoon over the pink pastry boxes I’ve planned for these that will make them all ready for gifting! Coral Charm Peonies will rule this event! They are the focal of these designs. You can pre-order to ensure you get some stellar blooms for mom before I sell out by texting me at 845.742.4539 and pick up at the store this Saturday, May 12th! Just in time to have them fresh and ready for Mom! It’s always fun to see our work get a little love! Our Winter Wedding Style Inspiration photo shoot was just featured on the Charlotte wedding planning blog Bustld. You can check out all the details which includes 3 separate looks, locations and bouquets here! Today wrapped up the 2017 wedding season for me here in Charlotte! Happy wedding day to Julia and Ryan who celebrated their nuptials in an intimate roof top gathering at the restaurant Fahrenheit in CLT. Here is Julia’s totally Fall flavored bouquet of Peach Juliet Garden Roses, Orange Ranunculus, Burgundy Cymbidium Orchids, White Hydrangea, Seeded Eucalyptus, Dusty Miller, Magnolia and Lamb’s Ear from the Mother of the Bride’s garden and Ryan’s matching Boutonniere! Enjoy! We’re featured over at Bustld today! How very exciting that this little styled shoot I had the pleasure to participate in is receiving so much attention. It is my very first styled shoot and it did not disappoint! I took this opportunity by the horns to step out of my comfort zone and use different techniques, materials and color palette than my norm. It is so different from anything I have created and was such a liberating and inspiring experience as a designer and as I step out on my own as Fleur-Di-Re in the Charlotte/Lake Norman area of North Carolina. So please, head over to Bustld today to check out the full feature of our jewel toned luxurious bohemian styled shoot! Enjoy! Annette and Peter first came across our work at their friends Sissi & Denny’s wedding. Annette was complimenting our flowers to a mutual friend of ours and found out that we were the floral designers. She immediately wanted us to do her own wedding flowers! In fact they booked us even before having any idea of decor or colors they wanted. All planning for this event took place over the phone and email. This is becoming quite common with today’s couple’s busy schedules. Sadly, we didn’t even get to see the lovely bride when we delivered and set up. This design concept sprang from the couple’s wedding colors along with some beachy accent accessories like shell photo frames and capiz dishes that Annette’s Mother purchased for them from her native Philippines. 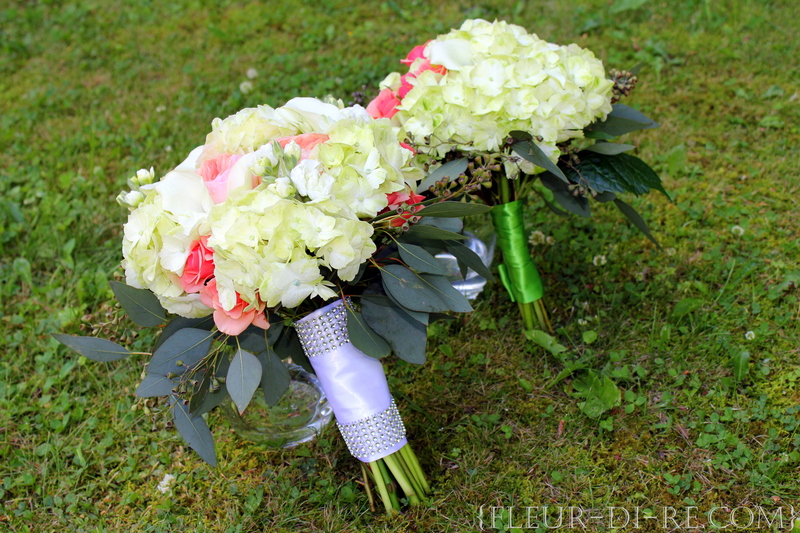 The Bride’s and Matron of Honor Bouquets. The Bride’s bouquet contained Green Hydrangea, Peach Garden Roses, Peach Spray Roses, White Mini Calla Lilies, White Stock and Seeded Eucalyptus with crystal ribbon detailing. 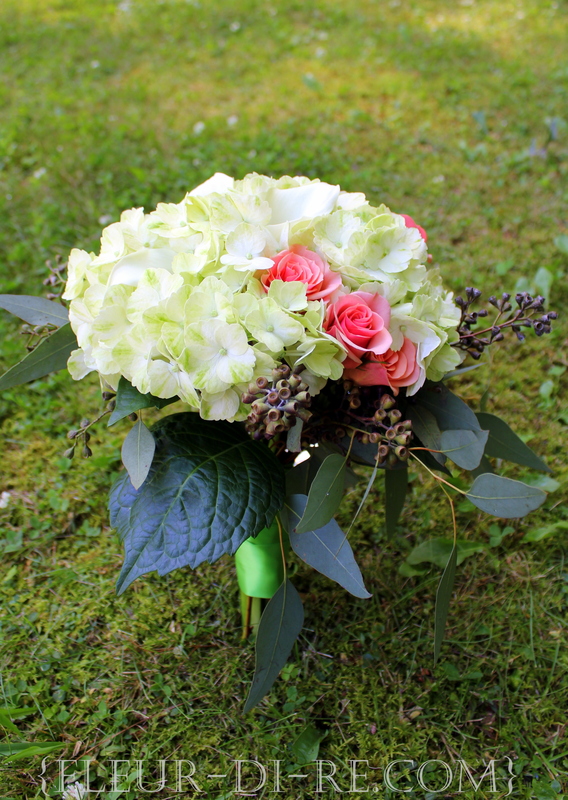 The Matron of Honor’s bouquet contained Green Hydrangea, Peach Spray Roses, White Mini Callas and Seeded Eucalyptus wrapped in Bright Green satin ribbon. We decided on adding the crystal detailing at last minute. We thought the bouquet needed a little extra something and this was the perfect touch to really set the Bride’s bouquet apart. The Groom wore a single White Mini Calla Lily with Seeded Eucalyptus. We wanted something light and airy as he would be wearing a traditional Filipino formal dress shirt called a Barong which is worn untucked and without a jacket. Mothers of the couple and Ninang (Godmothers in Tagalog) wore corsages of Peach Spray Roses and Seeded Eucalyptus. The Groomsman, Fathers to the couple and Ninong (Godfathers in Tagalog) wore boutonnieres of Peach Spray Roses and Seeded Eucalyptus. We took this picture of the centerpiece outdoors to show the true beauty of the colors in the arrangement as indoor photos don’t come out as good for us. 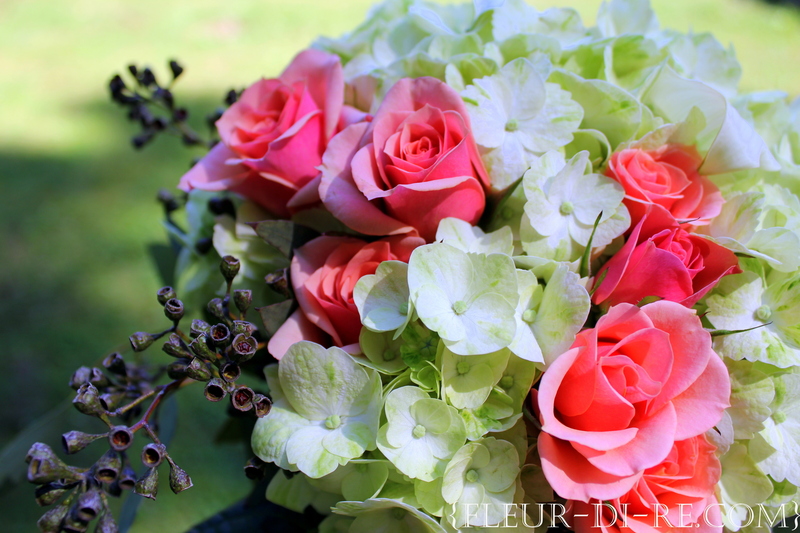 The centerpieces included Green Hydrangea, Peach Garden Roses, Peach Spray Roses, White Stock and Seeded Eucalyptus. We added shells and glass pieces to the inside of the vase to coordinate with the accessories that had been brought over from the Philippines. The centerpiece was formal yet relaxed which suited the cocktail reception. Congratulations to the happy couple! Thank you for choosing us for your wedding. We hope all enjoy these photos and as always we invite comments below. Plus, see how this wedding all came together on Pinterest. Challenge Accepted! Blue Up Lighting, Modern Decor in a very Rustic Venue with Green incorporated somehow. These were the parameters we were given to design around. Our jaws kind of dropped at first but we think we nailed it! We played with the idea of enclosing the rustic pieces within modern elements, just as the modern decor was enclosed in the rustic venue. Both the teenagers and the adults were very pleased :-) Another special aspect of this event was that every item was reusable except for the Callas. Now that is “Green”. No matter the event, we always remain true to our design integrity and produce events that we love and are proud of. These pieces could easily work for other kinds of events like weddings or even office decor. The concept is quite versatile. See the full gallery below. Enjoy, and as always, leave your comments below. We’d love to hear what you think. We placed blue LED lights inside the Silver Mirrored Votives to go with the blue lighting theme. The whole concept stemmed from light up lucite benches Rio and his sister fell in love with and used to create a club or lounge like setting. These Green Goddess Calla Lily arrangements were used to line the ceremony as well as on the buffets, bars. We used submersible blue LED lights that cast cool blue swirls through the arrangement. Jennifer, the beautiful mommy to be, simply loves baking. And so her dear friend Adelle, the organizer of this event, decided to do a “mini baked goods” theme for the shower complete with a gourmet bakery table for guests to “shop” from with lovely pastry boxes and featuring goodies from Balthazar, Flour, Payard and Sugar Sweet Sunshine. 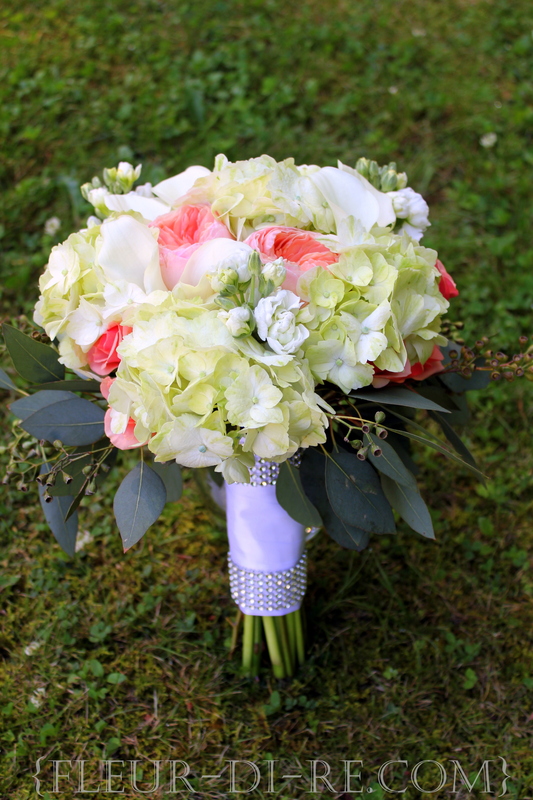 Once Adelle explained the theme to us, we immediately thought of using Ranunculus and Lisianthus. There is so much detail and layered beauty if those little flowers. Even the unopened buds add interest and playfulness to arrangements. And these flowers are perfectly sized for mini bud vases for which we knew would fit perfectly into the whole “mini” theme. We had seen floral cupcakes in a trade magazine surprisingly from a florist in Russia! They were very basic and inexpensive but were a hit with their clients and we saw how you could take the basic idea and make it so much more with flower selection and then adding the cake stands and cupcake domes took it to a whole new level of elegance. This design is very versatile. We see it being used for bridal showers, birthday parties and could even grace a desert table at a wedding. It’s cute yet sophisticated. See the full gallery below. Guest tables alternated between the cupcake domes and bud vase trios. A trio of bud vases filled with Pink Ranunculus, White Tulips and Pink Lisianthus. This three tier cake stand was the centerpiece to an amazing mirrored table used for the gifts. With a skylight and crystal chandelier overhead. The whole room filled with light, reflection and an airy feeling. Guests were asked to design a hanger for the baby’s closet. 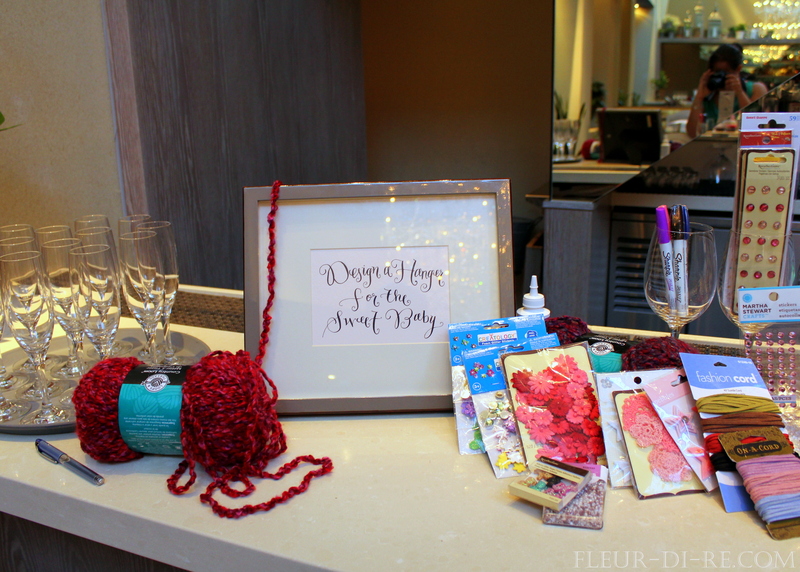 The fun arts and craft supplies were lined up at the bar. What a cute project for the ladies to enjoy and for Jennifer to have as memorabilia of a special day surrounded by all her best friends.